Scientifically, it's a combination of sulfur dioxide, methane, benzene derivatives and long chain hydrocarbons produced as various body parts decompose. But to those familiar with the stench of dead bodies, it's simply the smell of death. Like all smells, it is hard to describe. But unless you're a real vulture, you'll find the smell disgusting and sickening. Perhaps there is an evolutionary reason for our gut-wrenching reaction to the smell of death. We're repelled by the bloated corpse, and it's a good idea: its flesh harbors disease, it can sicken and kill. By avoiding rotting animal carcasses your ancestors lived long enough to pass on their genes! The smell of death can be a major customer relations problem in pest control. You've gotten rid of the pests, say a group of rats, but the resultant smell may make your customer think that the solution is worse than the problem! Dead animals will smell until they are completely decomposed or until they are dried out. The damper the site, the longer the odor will last. If a rat dies near a steam pipe, the smell can be horrible for weeks. The odor from a dead mouse may last only a day. In fact, there may be no noticeable odor from a single dead mouse, but several dead mice in the same area could be a problem. 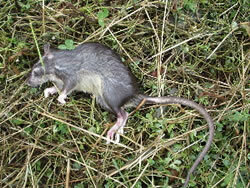 A dead rat may smell really bad for a week, but there can be some lingering odor for as long as a month. The obvious solution is to find and remove the dead animal or animals, then ventilate the site. But a better solution is prevention. In residences, offices or other sites where odors from dead animals are a concern, use pest-proofing and other IPM tactics to prevent pests from entering the structure. If there are rodents inside, use a control method that holds the animal rather than one that allows it to wander off and die in inaccessible areas. Use traps rather than baits so that you can dispose of the carcass. 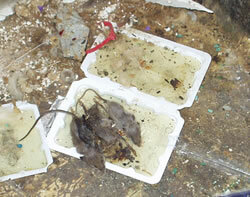 Check traps and glue boards often to remove dead animals. Dead insects can rot in an insect light trap (ILT) catch tray. Be sure to empty and clean them frequently. An insecticide-treated bee nest in a wall void can become quite stinky as the dead bees and the brood rot and as the the honey deteriorates. 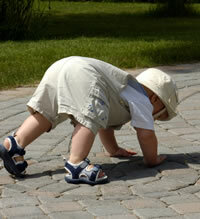 There are several ways to get rid of odor problems in a building. You can take the odor out of the air by using an air cleaner with an absorbent filter. You can add something to the air that neutralizes the odor. Or you can add a new, more desirable odor that temporarily masks or covers up the bad odor. Air cleaners usually use a replaceable absorbent filter such as activated charcoal or silica gel. When room air circulates through the filter, it absorbs and removes particles. Odor neutralizers often contain bacteria or enzymes that break down the organic compounds that are causing the odor. Others use ionic minerals to neutralize odors. Some odor neutralizers also contain an artificial fragrance, but many do not. 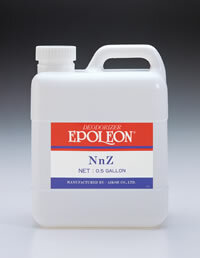 Odor neutralizers are available as powders, granules, sprays, or as rods. Masking deodorants are highly concentrated fragrances that simply cover up the bad smell. They don't neutralize it. They can be applied as granules, aerosols, mist sprays, or released through a cotton wick. Since they have a very strong fragrance, use them carefully to be sure they aren't more offensive than the original odor. To locate a dead animal in a wall void, use your nose. Flies in the room may lead you right to the spot (some technicians have been known to release flies to find a carcass). You may see maggots migrating away from the carcass. Or, with a larger animal, you might find a damp spot or a stain on the wall or ceiling. The best solution is to remove the carcass. But if you think you've found the dead animal and it can't be removed, drill a hole through the wall one foot above the floor and pour or inject a disinfectant, odor neutralizer, or masking solution. Do the same for the voids on either side. Using a multidirectional spray tip will give you better coverage inside the void. Be sure to plug the injection holes afterwards. If you can, seal off any cracks that are allowing the odor to escape from the void. Then, use a fan to draw fresh air into the treated area, forcing the old air out. Place the fan to blow air out of the window or vent that it is placed in and to draw in fresh air from another window or vent across the room. If you can't locate the carcass (or carcasses), you will have to apply a neutralizing or masking agent to the general area. Use a misting or ULD machine to treat the entire room. You will need to repeat the application until the carcasses are dry. You also may need to treat for blow flies, dermestid beetles or other pests that infest decaying carcasses.